Borrowing from the popular prayer shawl tradition, Norman-McFarlin UMC members create tiny "pocket prayer shawl" squares to remind mission volunteers, nursing home residents, Vacation Bible School participants, and others that they are blanketed in prayer. 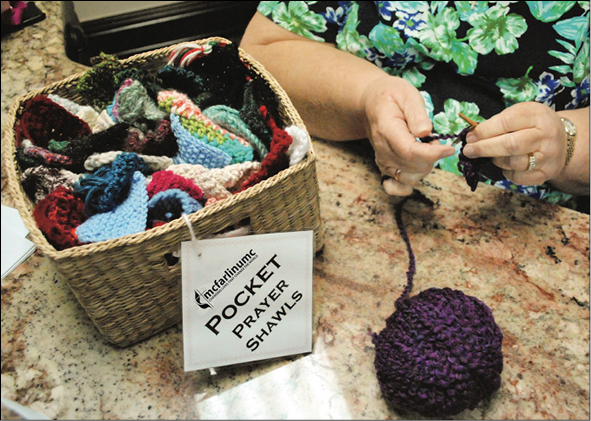 Susan Carruth, who is involved in McFarlin’s prayer shawl ministry, estimated the church has given out "thousands" of the knitted or crocheted squares. "People pray while they’re making them," she said. The squares, which fit easily in a pocket or purse, "represent a larger prayer shawl," said Jane Cook, also part of the ministry. A basket of pocket prayers is on hand at the church so people can take some to give out any time. Linda Harker, McFarlin’s senior pastor, posted a photo of one such square on Facebook. With it was a note from Carruth to a mission volunteer: "Just to let all of you know that you will be in our thoughts and prayers. Thank you for being Christ’s hands and feet and heart. Safe travels and God’s blessings." Some squares are well-traveled, Cook said. McFarlin’s chapel choir took 450 with them on a performance tour to New Mexico. The musicians handed them out at nursing homes where they sang. The idea started when the church planned a mission service trip to Mexico at a time when violence there was much in the news. Youths on the trip received the tiny squares to let them know "they were being prayed for when they were gone," Carruth said. The squares are usually made from yarn scraps left over from sewing prayer shawls, she said. They vary in size, 3 inches or smaller, depending on who makes them. Each one takes about 20 minutes to make. One member cranked out 400 for Vacation Bible School participants. "She is a machine," Carruth said. At Norman-McFarlin UMC, a volunteer begins shaping another tiny yarn square, a gift interwoven with prayers.